Dear Coinmates, we try to keep you posted about the important stuff only. When the market shifts dramatically, a fork is about to happen, or we implement something new and exciting. But there are also times when we just can’t help it and have to brag about ourselves. That time is right now. Was there ever enough good news? It is just a few weeks since we implemented Ripple on Coinmate and we do not have a reason to stop there, so we are not! You can now find Dash on our platform, we added it in pairs with EUR, CZK, and BTC. What should we do next? Let us know! Hello there, hope you’ve been all well and enjoyed the time with our latest articles. We showed you how to get around Coinmate a bit, also how to trade and deposit funds. Now that your Coinmate balance is positive, it is the best time to talk a little bit about how to keep your money safe here. Since we implement very tight verification policy and we strive to check all the sensitive operations by our staff, not algorithms, we managed to create a pretty safe environment so far. But as you can guess, there are few things we need you to do too, to keep your account secure. It is all about a few basic things to keep in mind. Dear Coinmate fans, we are happy to see you back with our basic how-to series. Last time we described how to get verified, hope it helped. But you must be eager to buy your first cryptocurrency now, and we would also like to give you few hints how to do that and which Coinmate features you can use. 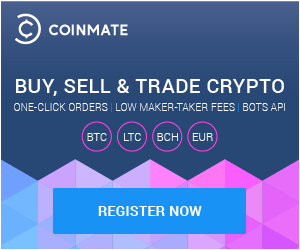 Welcome to Coinmate, either this is your first cryptocurrency exchange, or you are experienced user, either way, it would be nice to give you a few hints on how to start here. All such sites have their specific procedures and sets of rules. Wanting to be as welcoming as possible we decided to provide you with articles containing basic information about trading, verification, security, and other essentials not only regarding Coinmate, but the crypto world in general. Do you remember the time when it all started? We all gathered our intel about crypto from the dustiest corners of the internet, before the outbreak just a fraction of people knew about Bitcoin and even fraction of that used it.